There are those that have no control of their eating habits, and they can succumb to one of many eating disorders, each with its own causes, symptoms and actions. 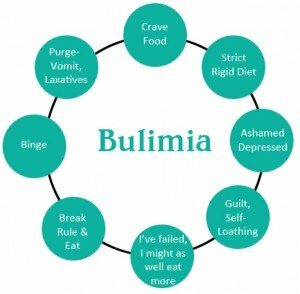 Bulimia nervosa is an eating disorder that happens more frequent than anorexia; it is less life-threatening though can still lead to death. It is most characterized as an eating disorder that causes the person affected to binge-eat and purge. First named and described by the British psychiatrist Gerald Russell in 1979, the purge is typically by force vomiting; but can also include using laxatives, diuretics, or stimulants, and/or excessive exercise, commonly caused by an obsessive concern for body weight. The disorder can also cause fasting, where the person eats nothing for long periods of time. Purging and/or fasting can cause serious health risks, such as potassium loss and health deterioration. In severe cases it also brings about depression potent enough that it leads to a high risk of suicide. According to Hay PJ, Claudino (“Bulimia nervosa” – Clinical Evidence 2010), many who suffer from Bulimia also suffer — or have suffered — from other psychiatric disorders. These may include mood disorders, anxiety, impulse control, and substance-misuse disorders. Bulimia patients also tend to have “impulsive behaviors involving overspending and sexual behaviors as well as having family histories of alcohol and substance abuse, mood and eating disorders” – (as noted by Yager J. in “Bulimia nervosa,” published in The Western Journal of Medicine in 1991). Bulimia has a genetic component as well: syndromic bulimia attributed to heritagebulimia symptoms is considered to be 54–83%. Women make up about 80-90% of those that suffer from Bulimia. And in a survey of about 500 women, almost 12% admitted to experiencing some form of eating disorder before the age of 20. Women are deluged with media images of the perfect female specimen, adding pressure for many to remain thin and fit by any means available. (This is a social component issue that we’ll discuss in a future post). Chronic gastric reflex after eating. Dehydration and hypokalemia caused by frequent vomiting. Boerhaave syndrome, a rupture in the esophageal wall due to vomiting. Oral trauma: repetitive insertion of fingers or other objects into the mouth causes lacerations to the lining of the mouth or throat. Enlarged glands in the neck, under the jaw line. Calluses or scars on back of hands due to repeated trauma from incisors. The frequent contact between teeth and gastric acid, in particular, may cause severe dental erosion, Perimolysis, or the erosion of tooth enamel, Swollen salivary glands, Constant vomiting can lead to gastroesophageal reflux. There are many signs that someone may be suffering from Bulimia nervosa. Some bulimics will exercise obsessively to the point that they do little else. Other signs that someone should seek eating disorder treatment include a fixation on the number of calories they consume; a fixation on weight; low self-esteem issues; low blood pressure; and, irregular menstrual cycles. constant trips to the bathroom. physical complications like tetany, epileptic seizures, cardiac arrhythmia and/or muscle weakness. If you think you or a loved one is suffering from Bulimia, talk to a counselor right away. A life may depend on it.